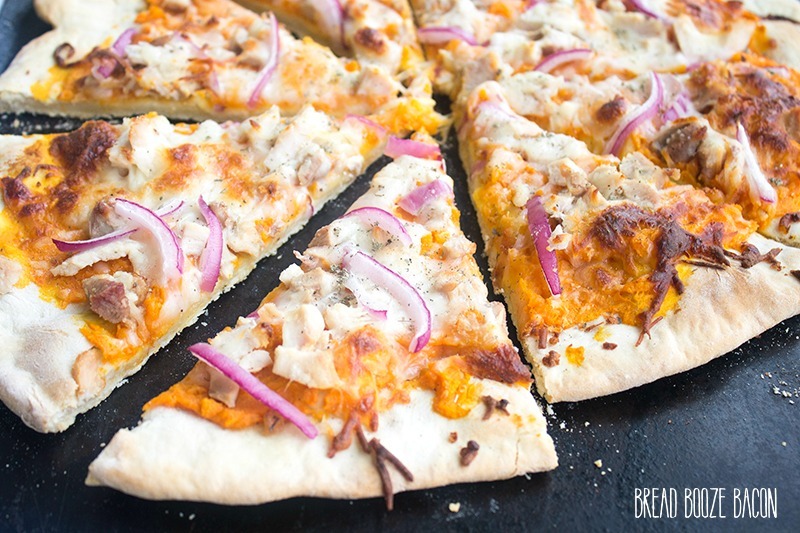 Sweet Potato & Turkey Pizza is a delicious spin on a favorite holiday pairing! 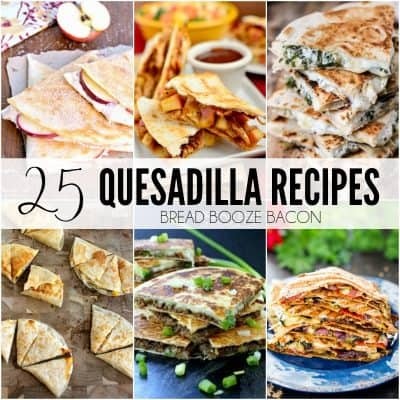 What a wonderful way to use up any holiday left overs you may have! I hope everyone had a fantastic Thanksgiving! I have a fridge full of leftovers staring at me and I can’t think of anything better to make than this pizza. It’s the best way to enjoy my favorite Thanksgiving flavors any time of year! I don’t know about you, but I’m a sweet potato fiend. I make them roasted in a dead of the Arizona summer, much to my family’s dismay. We serve them mashed with Thanksgiving dinner. And I’ve been know to whip up a sweet potato pie now and again. 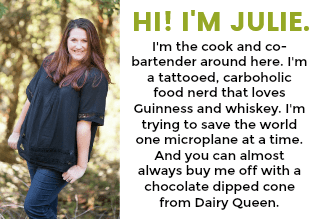 This recipe start is made from scratch. From the homemade pizza dough recipe to the sweet potatoes. 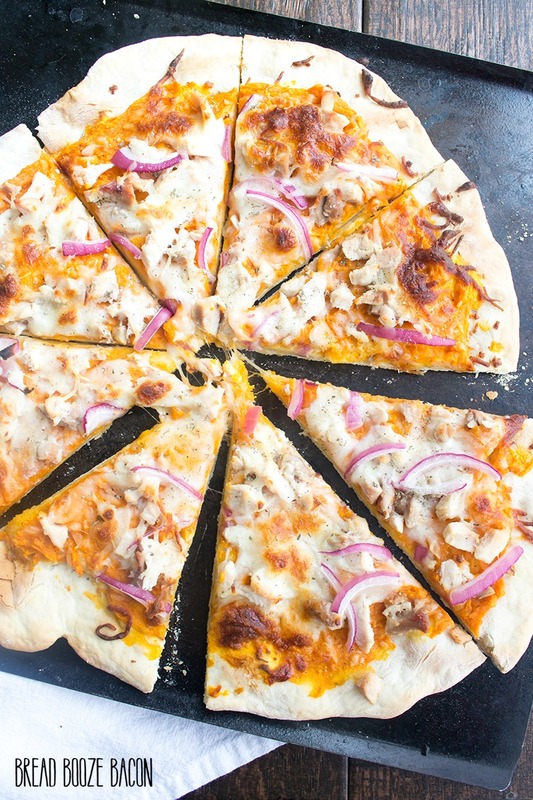 But this pizza is also a great way to reuse all those awesome Thanksgiving leftovers. Keepin’ it easy. 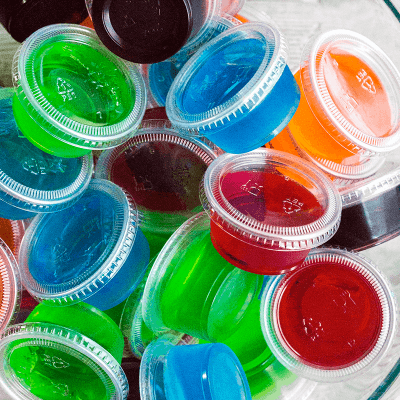 You can also add other toppings if you want. A little stuffing, a few toasted pecans after the pizza’s done cooking…it all tastes delicious! So have some fun and break out of your regular pizza cycle! Preheat your oven to 400 degrees F. Line a baking sheet with parchment paper or a Sil-Pat. Place the cubed sweet potatoes in a large mixing bowl. Drizzle with 1 tablespoon oil and sprinkle with 1/4 teaspoon salt and 1/8 teaspoon pepper. Toss to coat the potatoes. Pour the potatoes onto the prepared baking sheet and spread into and even layer. Bake for 30 to 40 minutes or until fork tender. 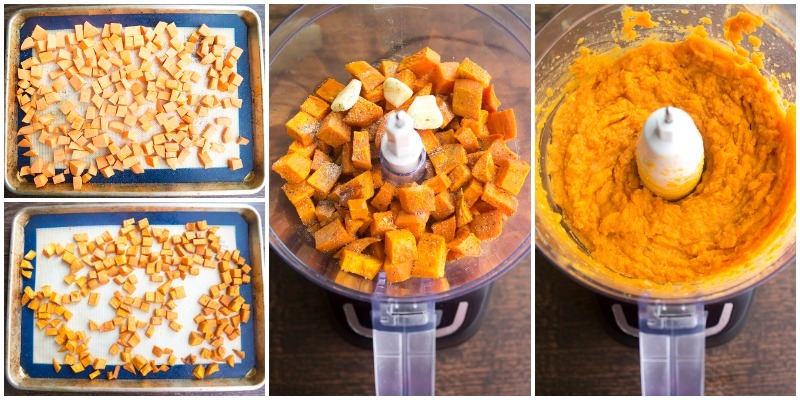 Transfer the sweet potatoes to a food processor or blender. Add the garlic cloves, maple syrup, and a little more salt and pepper to the potatoes. Cover and puree until smooth. Drizzle in water as needed to thin our the sauce to your desired consistency. (I used about 1/4 cup water.) Scrape the sides of your food processor as needed with a rubber spatula. Turn your oven's heat up to 475 degrees F. If using a pizza stone, place it in the oven to preheat. Roll out your pizza dough on a floured surface to a 12-inch circle. 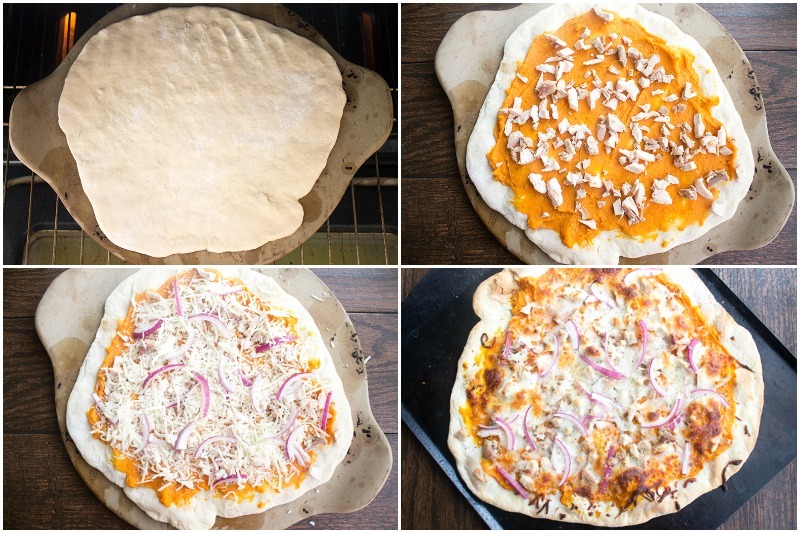 Transfer the dough to your preheated pizza stone (in the oven - be careful!) or a baking sheet lined with parchment paper. Bake the dough for 8 minutes. Carefully remove the pizza crust from the oven. 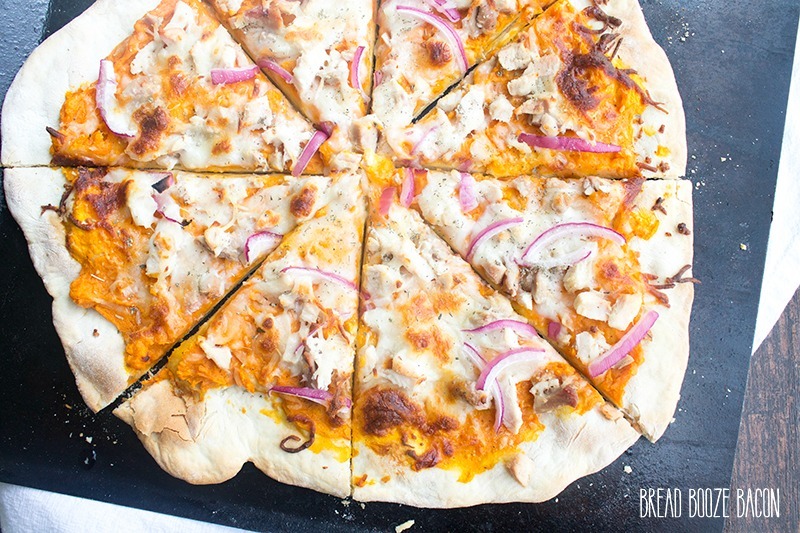 Spread the sweet potato sauce over the pizza crust to within 1/2-inch of the edge. 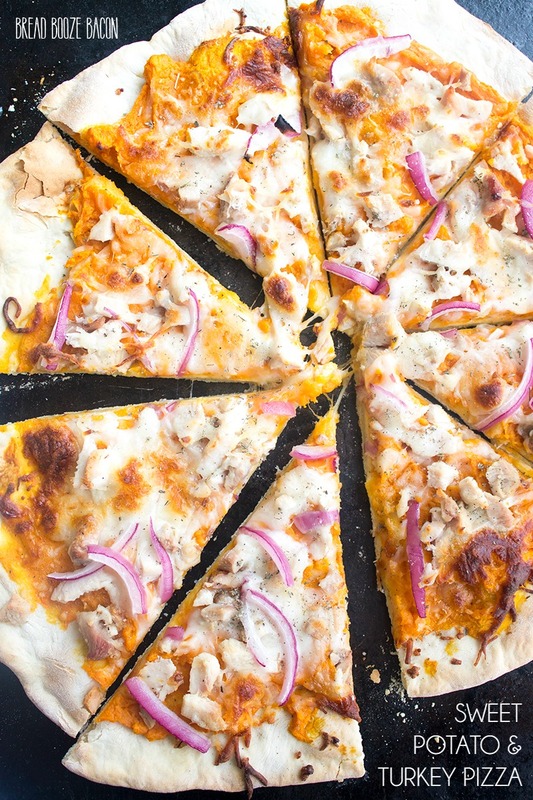 Top the sauce with chopped turkey, mozzarella, and onions, spreading each layer evenly all over the pizza. Return to the oven and bake for another 10 to 15 minutes or until the cheese is melted and bubbly. Sprinkle the dried sage all over the top of the pizza (i rub it between my fingers to break it up really fine.) Cut the pizza into slices and serve immediately. You can also use leftover roasted or mashed sweet potatoes from the night before as the sauce base. Sauce recipe adapted from Minimalist Baker.